A fire pit or fireplace can add something extra to someone’s home. Using a fire pit outside the home or a fireplace inside the home can create an atmosphere of comfort. People love to sit by a fire and reminisce about fond memories. They are great for summer get-togethers outdoors. Plus winter nights in snuggled on the couch are wonderful by a warm fire. A fireplace and fire pit do not need to be sooty and create a mess. Instead, it can stay beautiful while in use and even when it is not. To have a truly beautiful fire pit or fireplace use fire pit glass. This glass is made to come in a variety of colors and sizes. The different colors can be chosen to help match the existing décor or to add a bit of color to an area that is lacking. The glass is safe to use and looks very impressive when the fire is roaring. It should only be used as directed by the company to ensure the safety of the user. Fire glass is a surprising addition to any landscape. The dramatic colors of the glass will impress any guest. There are a variety of ways that fire glass can be used. While it was created to be used in a fire pit or fireplace this glass is wonderful to add to all areas of the home. It is safe to use and will make a colorful addition to plants, walkways, and much more. Fire glass is able to replace unsightly items in a fire pit or fireplace. Items like ceramic logs or lava rocks. Traditional items that are put into a fireplace are not aesthetically appealing unless they are burning. They are drab in color and collect soot after they have been burning for long periods of time. These other items do not have a lot of colors and are something guests have seen in every other house they have visited. Fire glass is a striking addition to any home and many people are wowed by the vivid colors it comes in. To add something different to a house’s design purchase fire glass for many areas in the house or yard. The fire glass is used as a filler for a fire pit or fireplace. It is meant for decoration and will not be the fuel for a fire. This means it will not burn without another source like natural gas. Many people assume fire glass is similar to charcoal and will burn without any propellant. This is not how the glass has been designed since it is to add a flare to the fire pit. It is unable to be used in a fire application that uses wood burning techniques since it does need the additional fuel like natural gas or propane. Fire glass is not flammable. That means it will not start on fire if someone attempts to light it. It is not intended as the source of fire for a fire pit. Instead, it is used as a decoration on top of the fire pit to create a more sophisticated, clean look. To use fire glass there must be a fuel source. This source can be natural gas or propane. Propane does have special instructions but it still can be used safely with fire glass. The best fire pits or fireplaces to pair with fire glass are created by Exotic Pebbles and Glass. These fire appliances will be specifically designed to make the fire glass look like it is burning evenly. There are different points where the fuel will come out of to ensure that multiple areas of the fit pit are burning. This will give the illusion that the fire glass has started to burn and it has spread across the entire pit. If there is an existing fire pit it is okay to use fire glass with them. If there is only one point of fuel for the fire it is less likely to give off that even, natural glow of a fire. The flame will be contained to where the burner is. 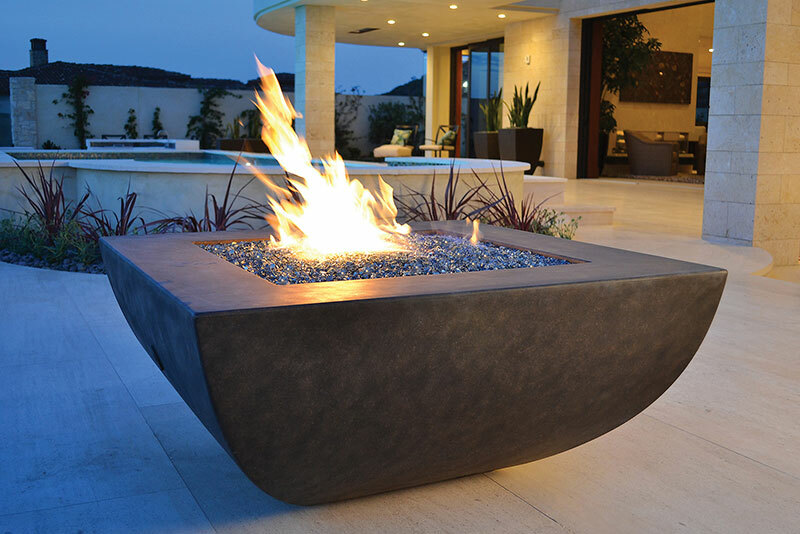 It is ideal to use a fire pit that has multiple burners to have a spread out fire appearance. To “light” the fire glass, simply use an extended lighter. Turn the gas on and hold the extended lighter close to a burner that is running. With the gas on the fire will light and it will stay lit until the gas is turned off. Fire glass is made to withstand higher temperatures so most natural gas or propane fire pits work well. Fire glass can be safe to use in a variety of places. Using it in a fire pit or fireplace that uses natural gas or propane is ideal. Propane fire pits do have additional instructions that need to be followed to safely use the fire glass. The only limitation is avoiding fire glass in something that is meant for wood burning only. Even if the fire glass is not paired with a fire pit or fireplace it can still be a great addition to the home. With its bright coloring, it can be a great filler for plants or in a rock bed. It will be similar to the natural rock that is already used but provide a much more interesting take on the design. There are many ways to use fire glass to elevate landscaping. Any area that a person could typically see rock or dirt could use fire glass. It has been used to line sidewalks or concrete patios. The color adds an additional dimension to the design. Using fire glass in a garden can help add in color for the months that flowers cannot bloom. That way the landscape always looks beautiful, even when the colder months intervene. Since fire glass is a new product to a home many people have trouble judging how much is needed to fill a fire pit. It is easy to calculate if the coverage calculator tool is used. This tool is simple to use. Simply measure the fire pit or fireplace that needs the fire glass. With this measurement in mind plug in the numbers into the calculator. It will estimate how much is needed of the fire glass in pounds. This makes it easy to have enough fire glass to fill the fire pit or fireplace. Do not worry if too much fire glass is ordered. There are many other areas that would benefit from a little color. Add it into the rest of the landscaping for little pops of color. There are recommendations for how deep to have the fire glass. In a fire pit or fireplace that uses natural gas about two to three inches of fire glass should be used. This is enough to cover the burner in the fire pit. If using a propane fire pit or fireplace there should not be more than an inch of fire glass. This is enough to cover the burning in this type of fire appliance. If there is a very large fire pit to fill there is no need to buy mass quantities of fire glass. It is perfectly fine to use a filler and top that with fire glass for a well polished look at a lower cost. If using a natural gas appliance there are two options. Using sand or Exotic Glass Base Filler. These options are both safe to use with the fire glass. There are fillers that are not safe to use under fire glass. Fillers like lava pebbles, lava rocks, general landscaping rocks, and porous materials should not be used under fire glass. If these materials are used safety is not ensured and damage to the product can occur, not to mention the risk of injury. There are two different types of fire glass to choose from. The Recycled Glass and the Tempered Reflective Glass. There is a different process for making each type of fire glass. They are recommended for use in different locations or fire appliances depending on how they are being used. The Recycled Fire Glass is made from window scraps and glass bottles. These are obtained after production from different agencies that are seeking to reduce their waste and reuse the product. The glass is melted and processed again using a specific furnace for re-purposing the glass into the beautiful fire glass pieces. With this process there is a different formula for each color of glass. By following this formula there are many dashing colors to choose from to match different décor. After the glass has been colored according to these specific formulas they are cooked. When the cooking process is complete the fire glass must be cooled before it is made into the small pieces ready for consumer use. This new glass is crushed into small pieces to be used as fire glass. These pieces are sized to create a more even look throughout the container of fire glass. The edges of these pieces are smoothed so there are no sharp pieces left. This is a much easier product for people to handle. With this type of fire glass, it can be used in a few different places. It is great for much more than putting into a fire pit. It can be used in the garden around plants. Inside of containers and planters to give a pop of color throughout the yard or house. Even put it inside of a fish tank or fountain for a beautiful and shimmery look. With smooth edges, it is easier to use this type of glass in many different locations. The Reflective Fire Glass is made from tempered glass panels with a mirror finish. This glass is broken and gives off dancing reflections as the fire burns. With this type of broken glass the edges are not finished. That means there is the possibility to be cut by the glass as it is being placed into a fire pit or fireplace. With this in mind it is not recommended to use this type of fire glass in areas other than a fire application. It is dangerous to add it to other areas that could be frequented and accidentally brushed against. While installing the fire glass take special care to avoid injury. The size of the fire glass is important because of the reaction glass will have in heat. As a piece of the fire glass is heated in a fire there is an air bubble inside that is able to trap heat. Over the course of use this heat can become too much for the glass and cause it to fracture. This damages the glass and will take away from the pleasing look of the fire pit. These air bubbles are trapped inside of the pieces of glass during production. The bigger the piece of glass the larger the air bubble can become. If the bubble is bigger it is more likely to break in the fire. This can cause the need to throw away the damaged pieces. It is recommended to only use fire glass pieces that are smaller than an inch. This is going to reduce like likelihood of the pieces becoming damaged in the fire. The Recycled Fire Glass comes in two different sizes. There is a small size that has pieces that are one-fourth inch to one-half inch. The second size is a medium that ranges from one-half inch to one inch. The Reflective Fire Glass only comes in one size of one-fourth inch. These sizes are ideal for use in fire pits or fireplaces so they do not become damaged. The life of fire glass depends on how it is treated. If properly cared for the fire glass can last for a long time in a fire pit or fireplace. The way fire glass is made ensures that it is able to hold up to higher temperatures. In natural gas, the fire glass is less likely to become damaged or discolored. Propane can cause damage to the fire glass. It can still be used but there is some cracking or change in color that is expected. When the fire glass burns with propane glass it may break and the color may darken over time. While there are instances that fire glass cracks it is likely to last a lot longer than traditional fire fuels. Since it is designed as a decoration and not a fuel type there is much less stress on the product. There is no need to replace the fire glass every time a fire is list. It will not burn down like a natural log would and it stays beautiful for many wonderful nights by the fire. There are online retailers that sell Exotic Fire Glass. Take a look at the Exotic Pebbles and Glass website to learn more about online retailers that sell the product. When looking for a specific color it may be easier to purchase online. If purchasing fire glass in person to judge color better, look for a local retailer. There are many Lowes stores that sell fire glass. There is both Reflective and Recycled Fire Glass available to purchase. Always contact the local stores before going in to purchase fire glass. They may not be a participating store. Fire glass is safe to use, if the user does properly care for the glass. If the glass does become broken or damaged, by using in a manner that is not recommended, the glass is able to crack. This can become hazardous if a person cuts themselves with the newly sharp edge of the glass. Always take care to pick up the fire glass with protection to avoid accidental injury. When burning, fire glass will not melt if it is in a fire that is less than 1500 degrees Fahrenheit. The glass does not give off any toxic fumes as it burns, either. The color and consistency of the glass with remain the same if not damaged by too high of temperatures. 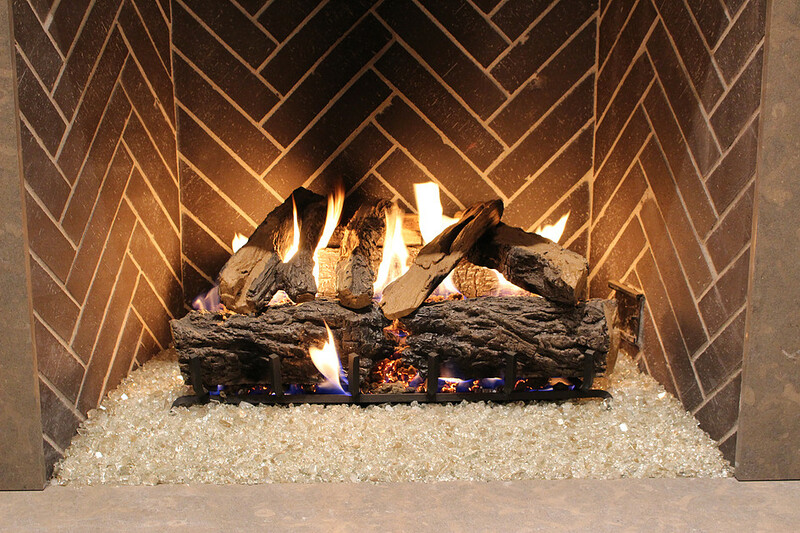 Natural gas is the best to use when using fire glass to ensure the color stays consistent. If using propane avoid using lightly colored glass. Propane is able to alter the color of the glass which is more noticeable on the lighter colors. The propane changes the color because it leaves a residue on items as it burns. When using the glass in direct flame of propane gas it is best to use a dark color to hide this discoloration. Natural gas is the preferred choice for fire glass. It is able to preserve the beauty of the glass for longer and there are not as many precautions to take against damage. It is the easier choice and is much less hassle to use. However, it is not a necessity to use natural gas if a person is willing to put in some added work. The reason natural gas is better for fire glass is in the way it burns. When natural gas burns it is much cleaner than that of propane. There will be no leftover residue that will sit on the surface of the glass. Natural gas does not give off as much carbon and there is a lot less soot build-up as the fire burns. That means more fires with less mess. If propane is preferred in the household it can be used with fire glass. There are a few key points to note. Propane is heavier than a natural gas. With this weight it will settle below the burner instead of intermingling with the air above it. With the collection of propane under the burner it is more likely to flare up as the fire burns. This flash of fire and heat can cause the fire glass to hold extra heat inside of the air pockets. This will cause the fire glass to crack and become damaged depending on the intensity of the flare up. With many flare ups the fire glass may continue to pop as the fire burns. To help reduce this problem it is recommended to use an LP converter. An LP converter will help the gas mix with air before it begins to burn. With this mixture the gas is able to float above the burner. This ensures that it stays lighter and will not cause as many flare-ups of the flame. It is also recommended to use a pan burner system if building a propane fire pit. This will help the propane stay above the surface to prevent flare-ups. The goal is to ensure that there is no propane under the burner and it stays circulating with the air above it. Fire glass is more than a fire appliance decoration. It is a way to decorate the entire home and enhance a landscape. It can be used in many locations to add color into typically drab surroundings. There are a variety of colors to choose from, so it is able to match any existing décor. Mix and match colors to create a whole new look. The best part about fire glass is that it is safe to use. It is produced in a way that reduces soot that comes off traditional fire pits. There are no harmful pollutants that come off the fire glass, so it can be used in more locations than just the fireplace. Even when the fire pit or fireplace is not in use the fire glass adds flare to any design. Plan to use fire glass in many areas of the home. It does not need to fill the entire container. Purchase a cheap filler like sand to fill the container to the top. Place the fire glass at the top of the containers to complete the look without spending the additional money on extra fire glass.